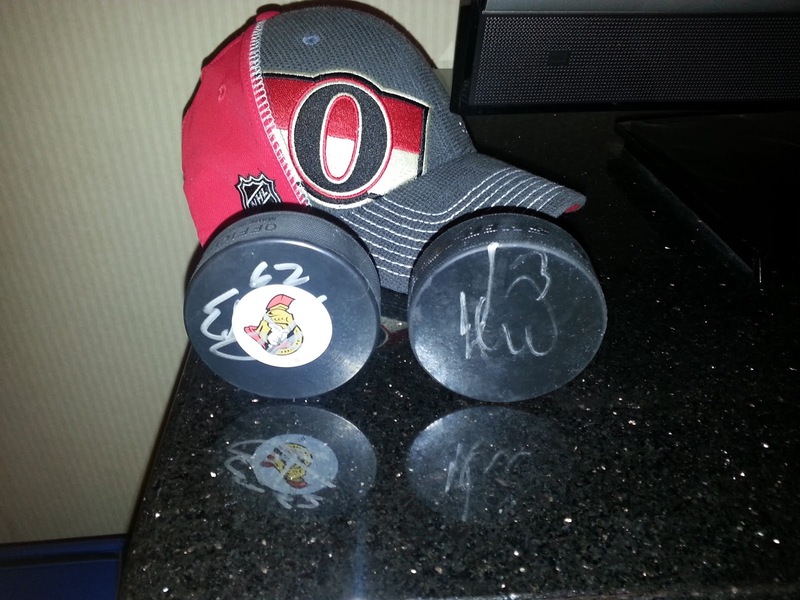 As an avid collector of Ottawa Senators memorobilia, I've decided to start a recurring feature on the blog to show off the various items that Sens fans own and treasure. Your collections can range from decorated rooms, to signed photos, to jerseys. I want to see them! Shoot me a tweet at @BringBackLee or an email to sensforlife11@hotmail.com and they will definitely be considered for future posts. I've already received an impressive wave of submissions. 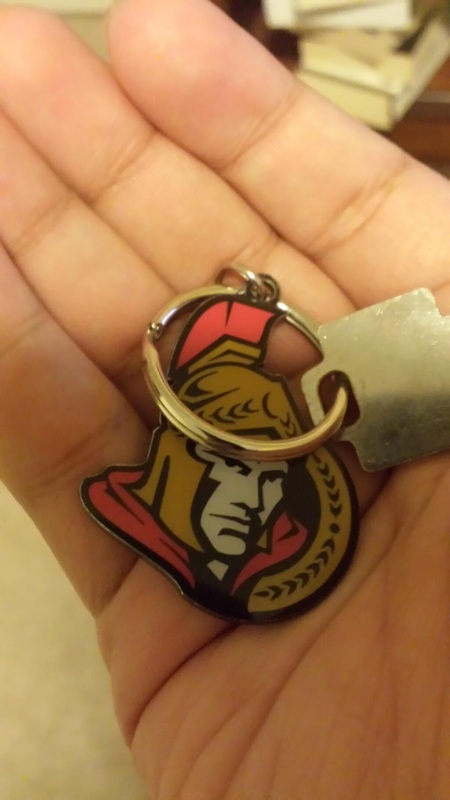 I've witnessed enough Sens merchandise to show you the good, the bad, and the ugly of people's collections. @DJRezz gets the good going with an incredible autograph collection. 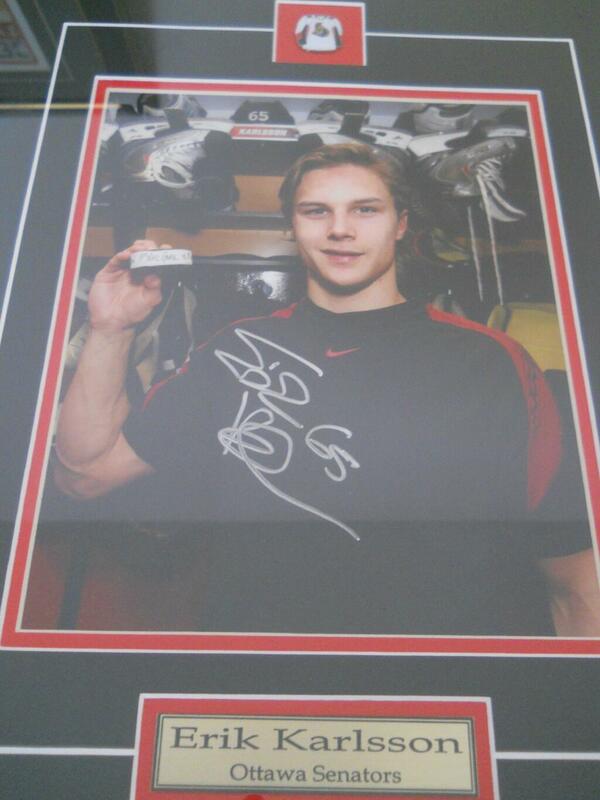 Starting off, we have a framed autographed photo of none other than Erik Karlsson displaying his first goal puck. Definitely a piece any Sens fan would want. We also have a giant team photo covered in autographs, including stars such as Matt Carkner, Filip Kuba, and Ryan Shannon. It's also autographed by some guy who signs with #11. My favourite piece of his is a Frameworth certified framed 8x10 photo signed by each of the four Ottawa Senators All-Star participants. 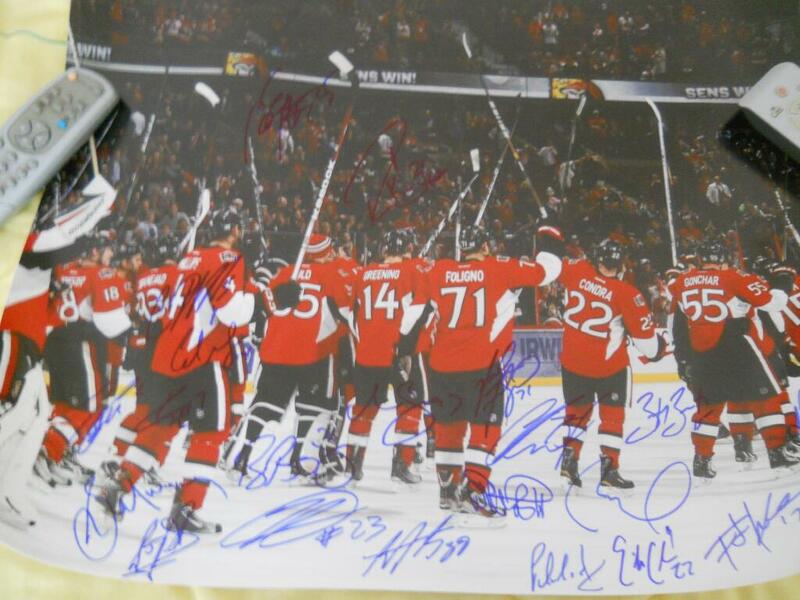 If you attended any Sens games last season, you may have noticed they had this item up for silent auction at quite a few of the games. It was definitely one of the more popular pieces, always attracting several bids. Very cool stuff DJRezz! From Rob Langston (@DJ_ImProV) (our second DJ) we get story of triumph. Rob and his family are actually out-of-towners from Newmarket, Ontario. However, being loyal fans, they made the trek up to Ottawa this past April to catch a game against the Washington Capitals. Before making the trip he inquired through social media whether it was possible to get any of player autographs at the game. Matt (@Mjeh24) responded to the call for help and knowing that he'd be going to the same game, offered to show them the spot. After a 3-1 victory, Matt led Rob and his family, including his son Christopher, to the loading docks where the players come out. Unfortunately, it began to rain, meaning the usual large crowd of fans didn't show up. As the drizzle changed to a downpour, the number of fans started to thin out. Being from out of town, a little rain wasn't going to stop Christopher from the chance to get autographs from his hockey heroes. Rob and his fiancée were worried that none of the players would stop in the inclement weather, but if their son wanted to stick around and try, they certainly weren't going to say no. Rob's son Christopher. Who's going to say no to that face? Rob found himself shocked when the first player who drove by stopped to sign Christopher's puck; it was none other than Eric Gryba. Before Christopher had a chance to get over his excitement, along came Marc Methot, who called them nuts for waiting in the rain. Chris Phillips and Jakob Silfverberg would also end up stopping. Rob was blown away at how the night had turned out and how Christopher was easily one of the happiest kids on Earth. The autographed pucks now sit on Christopher's shelf. 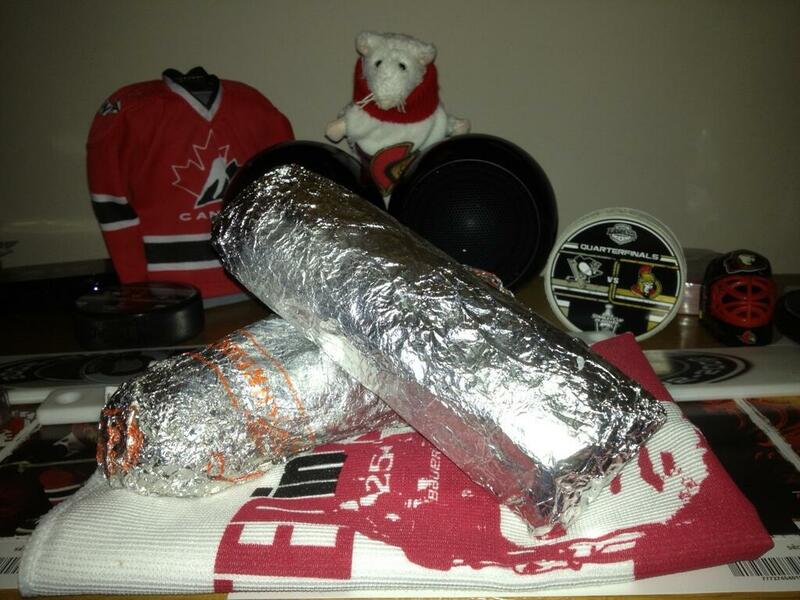 Courtesy of two well known Twitter personalities and Sens bloggers, we get the bad. Chet Sellers (@chet_sellers) shows off the now Twitter-famous Patrick Lalime jersey. What makes it bad? How about the fact that the jersey appears to be autographed in pen, and is made out to a name that isn't Chet? 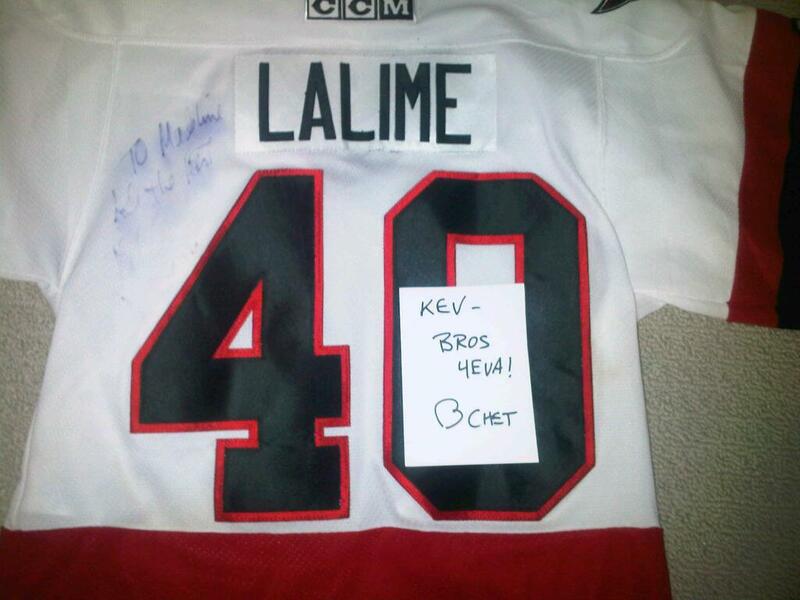 Add in the fact Lalime's autograph has totally faded away, this is easily one for the bad. What really makes it belong in this category though is how it was acquired in the worst way imaginable. Now you're probably wondering why this is his most valuable piece... well there's an explanation for that! Phil (@GimmeMyJetpack) made it easy for me to find some pieces to fit into this category. Being the smart consumer that he is, he always ensures that he gets the most bang for his buck on eBay. When I made him aware of an available Cory Clouston autograph, he jumped right on it! 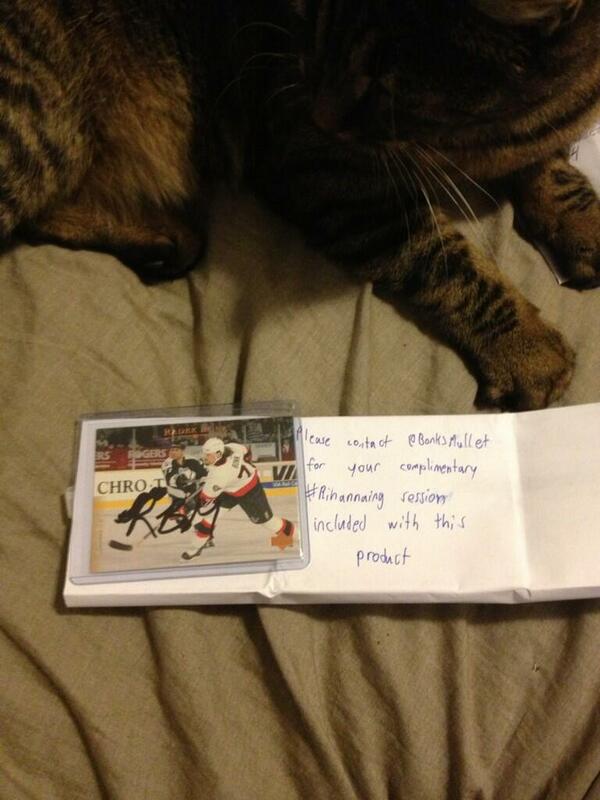 He can also be considered the biggest fan of this blog's founder, @BonksMullet. 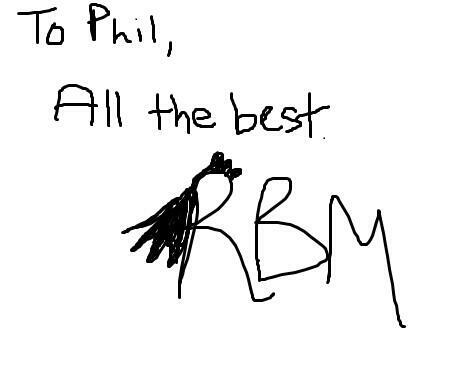 In fact, he was the first to ask and receive a digital autograph from the man himself! He needed a real copy for his collection though, and when one went up on eBay, he pounced. A fierce bidding war ensued, but Phil came out victorious and now displays this card proudly. Those are exactly what you think they are. Phil proudly displays game-used hot dogs from Spartacat's Master Blaster. 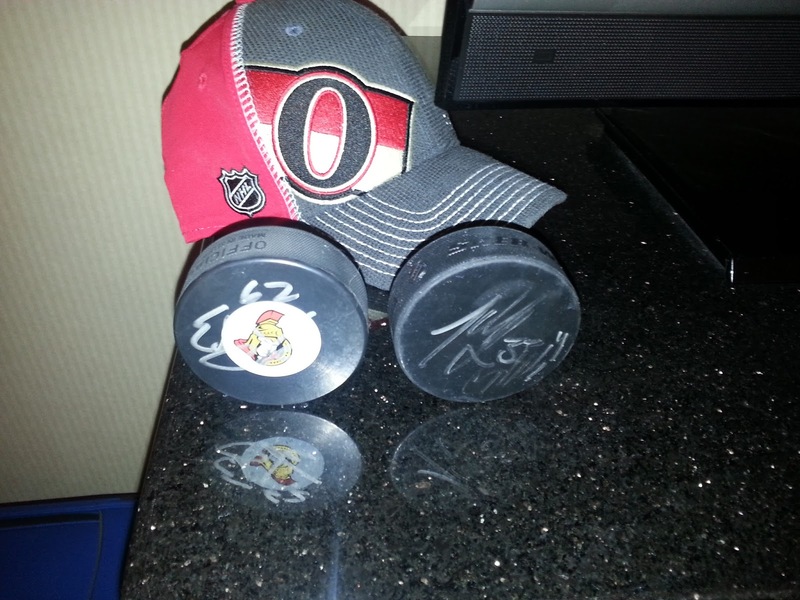 That's all for this edition of Sens Collectors and I hope you enjoy this and future editions feature. To keep it going, I need your help. If you have anything unique you want to share, contact me on Twitter at @BringBackLee or an email to sensforlife11@hotmail.com. Looking forward to hearing from some of you. Until then, thanks for reading!